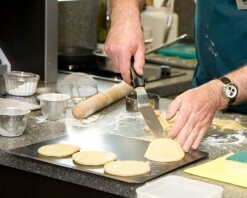 Basic Ingredients: The highly experienced and affable chefs at this state-of-the-art cook school in Kilmarnock welcome first-time foodies and fanatics alike as they set about creating a professional but laid-back environment with an excellent choice of things to learn. Classes focus on different ingredients such as meat, game, fish and shellfish and various themes from Mediterranean to fusion cooking. Day courses are £130 and typically last five and a half hours. Shorter courses, such as Steak Night, cost from £45 and last two and a half hours. To add to the mix, there are classes for kids and, for those who are less hands on, demo and dine evenings and a ‘Come Dine With Me’ experience, where the school hosts a dinner party for ten people. They say: Enter a different world of new ingredients and cuisines. We will change you from a beginner to excited foodie or you can simply learn fresh new skills or polish established ones. Each class is packed with tips, techniques and trade secrets, not to mention a whole lot of fun. We say: There are plenty of chances to do the course you want as each one is repeated every month. Check out the website for more information, including chef profiles, free seasonal recipes with videos and an introductory film of the school so you can ‘try before you buy’. Look out for three-for-two deals on the website.